From time to time, you may need to fasten two or more pieces of metal together without bolting, soldering or welding them. Fortunately, there are special adhesive products on the market made for gluing metal. Glues for homeowners needing to bond metal to metal fall into three general types -- epoxy, polyurethane and cyanoacrylate products. These products claim to make strong metal-to-metal bonds if users follow instructions. Metal-bonding adhesives are sold in hardware, home improvement and hobby stores. Always follow the manufacturer's safety instructions. 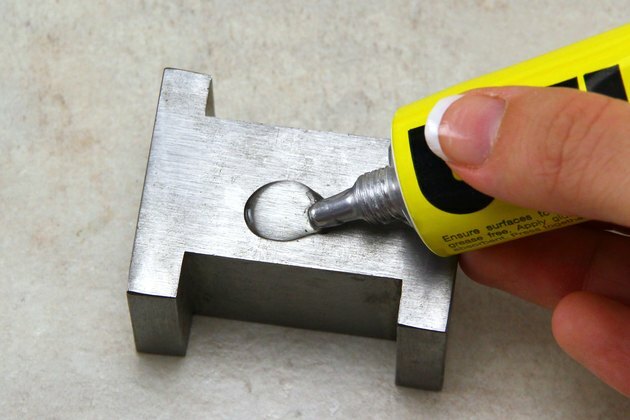 Careful preparation of the metal surfaces will ensure a strong metal-to-metal adhesive bond. Thoroughly clean the metal surfaces to be bonded. That means removing all paint, rust or corrosion with a scraping or sanding tool and removing dust, dirt, wax, oil or grease with a cloth or paper towel wetted with a degreaser or detergent. 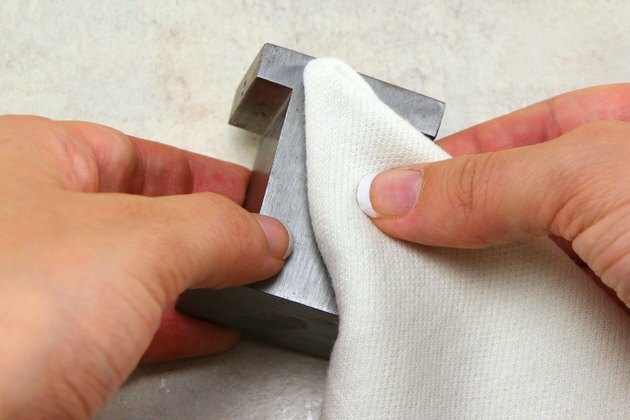 Use fine-grit sandpaper to roughen the metal surfaces you will be gluing together. Prefit the parts to make sure there are no big gaps. Take care to not touch your bare fingertips to the surfaces to be bonded. Apply adhesive to the prepared surface as the manufacturer directs. 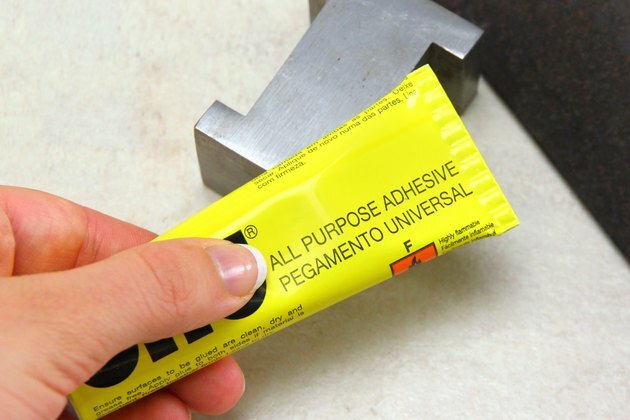 Most metal-to-metal glue products warn you to work in a well-ventilated area or outdoors when cleaning and gluing the metal, and avoid breathing the glue fumes as you assemble parts. Epoxy glues form the strongest metal-to-metal bonds. Most epoxy products instruct you to mix equal parts of adhesive and hardener and apply the mixed material with an appropriate tool to one of the surfaces you are bonding. Most epoxy metal glues for homeowners tell you to assemble the parts within a minute or two of applying the adhesive. Waiting too long will ruin the bond. Metal-to-metal epoxy glues typically instruct users to clamp the parts together for the first 30 to 60 minutes while the adhesive sets, but to wait up to 24 hours before putting the glued item back into service. These adhesives require considerable time to develop their full strength through a chemical curing process. Polyurethane glues are very sticky adhesives that will bond metal to metal as well as to a long list of other materials. These single-part glues need moisture to set but are waterproof once cured. Pieces to be glued must fit closely as these glues are poor gap fillers. Parts must be clamped for one to two hours as they set to prevent the glue from foaming and squeezing out of the joint. These glues develop their full strength after 24 hours. Polyurethane glues are not as strong as epoxy on metal but are strong enough for many purposes. Instant "super glues" are based on ethyl cyanoacrylate. 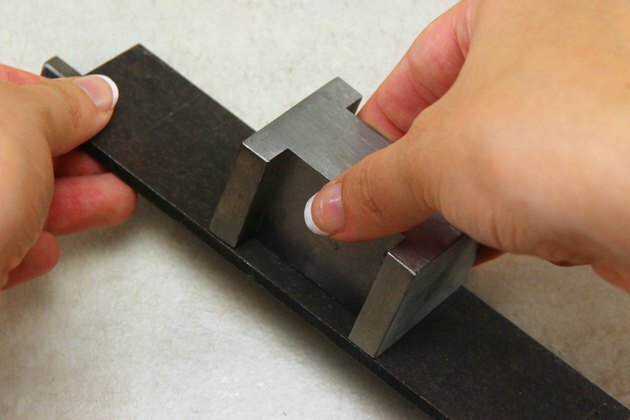 These single-part glues promise fast, strong bonds between metal surfaces. The glues' near-instant gripping ability makes them useful for many metal-to-metal applications. But they don't fill gaps or voids; they require that mating surfaces fit together perfectly for a strong bond. To use, clean the mating surfaces. Apply a small amount of instant glue to one of the surfaces, join it to the other surface and hold the pieces together for a minute. While these glues bond in under a minute, they need to cure overnight for maximum strength. 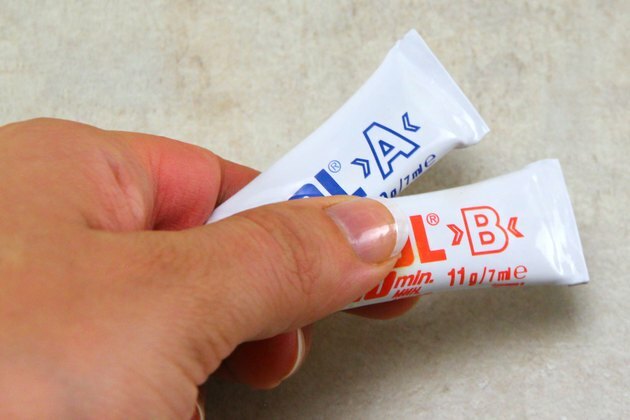 Be careful because these glues can bond skin to skin and to other surfaces.